Magnetic calendar pads – The combination of calendar and magnetic notepad makes these little giveaways perfect for sticking on a fridge or taking it along in a purse or briefcase. Either way, it’s a promo item your prospects will use every day of the year! Choose from magnetic calendar pads with recipes, tips, or inspirational images. Business card calendar magnets – Personalized Century 21 business card calendar magnets are a smart way to get the benefits of calendar marketing while maintaining a consistent brand image. Choose from two sizes and several styles (team cards, silhouette cards, luxury homes cards, and options with and without photos) to reflect your business personality. 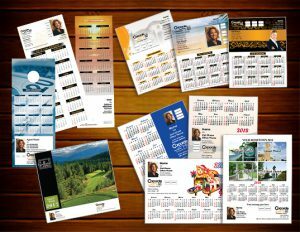 Full calendar magnets – These quick-reference magnets make it easy to see the full year at a glance, with 60+ design options and business-card styling that keeps your contact information front and center. Choose from three sizes of the standard full calendar magnet, or create a custom design by uploading your own photos. It’s perfect for an end-of-year gift that feels truly personal. Calendar door hangers – For real estate professionals who do regular seminars or networking events, calendar door hangers are a great way to personalize your information. Circle the dates for your upcoming events, and go door-to-door getting to know your target neighborhood. Calendar bookmarks – Looking for an easy and cost effective way to get your contact information in as many hands as possible? Real estate calendar bookmarks are a great choice. Small, inexpensive, and useful for recipients, they’re great to pass out at parades, include in a goody bag, or leave out at libraries and other local stores. Wall calendars – The traditional real estate wall calendar has been a staple for years, and for good reason: everybody needs one. Choose from more than 30 styles and designs for a look that suits your business perfectly. WOW desk calendars – These quirky personalized desk calendars are the perfect choice to grab attention and start conversations. Even better, you can choose the month the calendar starts, making this the promo gift you can hand out all year long.